A photograph of D.B. 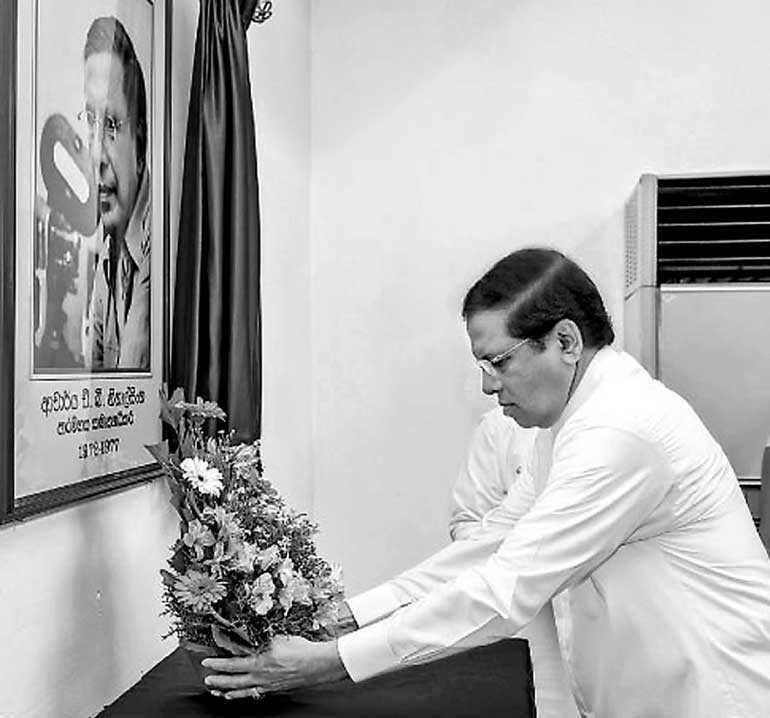 Nihalsingha, the first CEO and General Manager of the National (then State) Film Corporation was unveiled a few days back by President Maithripala Sirisena at the Corporation. It was a well-deserved recognition of a professional who laid a solid foundation for a State institution. The recognition came two years after his sudden departure which was a big blow to the progress of the Sri Lankan film industry. He was then concentrating on building up a new generation of filmmakers through a well-planned academic programme. The Kelaniya University invited him to plan a course in cinematography and head a new department. After winning the general election in 1970, the Sirimavo Bandaranaike Government’s decision to set up the Film Corporation came at a time when the local film industry was getting a raw deal. Distribution was one of the key issues. The theatres were screening foreign films which had a dominant presence as much as 80 percent in the local theatres. The local producers were naturally agitating for a fair deal for the local films. The newly-elected Government not only took the right decision but picked the right man for the job. Nihalsingha’s service over a period of six years (1972-78) was highly appreciated when he launched a series of initiatives to support the local industry. A Film Scripts Evaluation Committee was established with the aim of improving the quality of film scripts. Prior to the production, the Committee examined the merit of the script and graded these scripts that received the A grade were entitled to interest free loans. The Corporation was allowed to import and distribute films thus breaking the monopoly of three companies which brought in films. Nihalsingha changed the system of screening films, ensuring a better deal for the local films. The screen time allotted for locally made films was increased to 59%. Film circuits were set up with a ‘Fifth Circuit’ established to show more artistically-oriented films. “As a consequence of the new measures introduced by the State, filmmaking was perceived as an economically-profitable investment. Film production reached an all-time high.” – Profiling Sri Lankan Cinema 2000)Once he left the Corporation, Nihalsingha watched from outside how successive managements failed to keep the pace he started or did not have the vision to improve the system. A few years later the plight of the Film Corporation was the subject of the thesis he submitted for his doctorate from the Adelaide University during a stint he was away in Malaysia with ASTRO. ‘Public Enterprise in Film Development – Success and Failure in Sri Lanka’ came out as a publication revealing an interesting story. After a stint abroad Nihalsingha was back in Sri Lanka to continue his service to the industry he loved. It may be a little too late for the Philatelic Bureau to issue a stamp in his honour on his birthday which falls on 27 May, if it has not been planned already.